Chris Jenks of SMU Dedman School of Law was invited to discuss “Protection of the Environment: An Operational Perspective” at the United Nations in New York City Oct. 24. This is the first of two blogs; for the second one, go here. Before discussing the seminar, I thought some general background information on the United Nations might be interesting. I also can explain how the U.N. is involved in protecting the environment during armed conflict. The international community established the U.N. on Oct. 24, 1945, by ratifying the United Nations Charter. The U.N.’s formation followed two world wars that claimed millions of lives within 25 years of each other. Unsuccessful efforts to ensure peace following World War I included the League of Nations, an intergovernmental organization designed to maintain world peace, and the Kellog-Briand Pact’s idealistic ban on warfare. 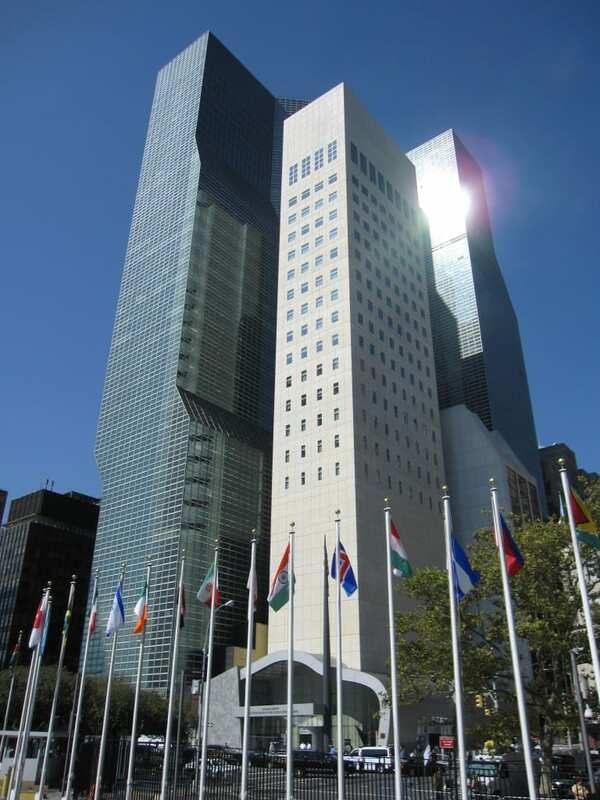 A new building housing the United States Mission to the United Nations, across from the U.N. headquarters, was dedicated in 2011. While the UN’s formal establishment was not until the Charter’s ratification after the conclusion of World War II, some 50 countries signed the Charter in San Francisco in June 1945 when the war with Japan was still ongoing. China, the Soviet Union, the United Kingdom and the United States developed the Charter the preceding summer, 1944 — roughly a year before the end of the war with Germany. The structure was designed by lead architect Charles Gwathmey, responsible for the 1992 renovation of Frank Lloyd Wright’s Guggenheim Museum in New York City. The U.N. Charter established six principal parts of the United Nations: the General Assembly, the Security Council, the Economic and Social Council, the Trusteeship Council, the International Court of Justice, and the Secretariat. Over time the U.N. also has formed 15 agencies and numerous programs and bodies. 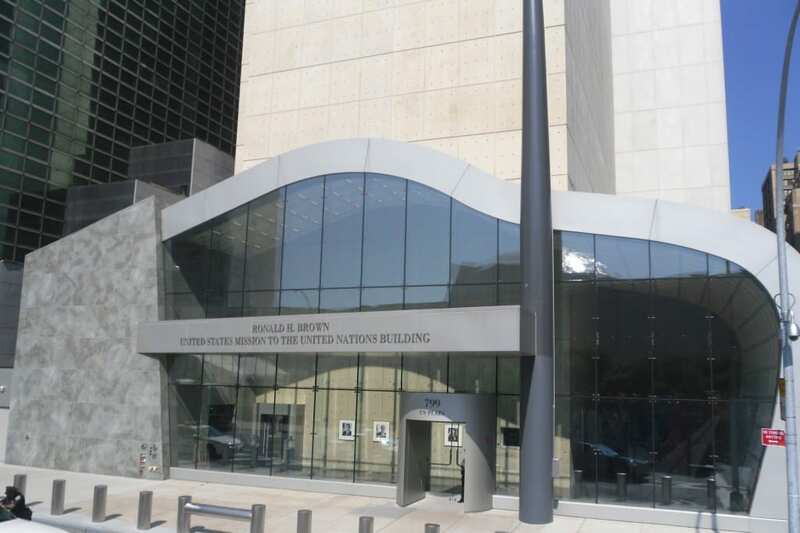 The U.N. headquarters is in New York City pursuant to an agreement between the U.N. and the U.S. And while much of the U.N. is in NYC, there are U.N. offices in a host of countries around the world. Not counting peacekeepers there are more than 80,000 U.N. employees. The organization’s annual budget exceeds $5 billion (U.S.), which is derived from assessments on member countries. A complicated formula determining the amount each country pays to the U.N. is based on a host of factors, including gross national income. The result is that the U.S. assessment constitutes 22% of the U.N.’s budget. From there the next highest contribution is about 11% from Japan, and the contributions drop off from there. The U.N. Security Council is the organ that can authorize the use of force. Not surprisingly when you think about the U.N.’s formation, it was the major allied powers from WWII — the United States, United Kingdom, Soviet Union, France and China (the P-5), that received permanent seats on the Security Council — and the ability to veto any proposed action. In addition to those five permanent members, 10 other countries are represented on the Security Council, with slots rotating among the world’s other countries. After the U.N. recently held elections, Angola, Malaysia, New Zealand, Spain and Venezuela were elected to serve a two-year term as non-permanent members of the Security Council, joining the P-5 and other non-permanent members Chad, Chile, Jordan, Lithuania and Nigeria, whose terms expire at the end of 2015. It’s interesting to think that in our grandparents’ lifetimes, the permanent members of the Security Council all fought as allies on the same side during WWII. Yet since the start of the Cold War less than five years after the U.N.’s formation, permanent members frequently fight among themselves (bureaucratically and ideologically, at least). Indeed disagreement between various combinations of those former allies is viewed by many as one of if not the largest obstacle to the U.N. taking effective action. Most recently these challenges have been cited when examining the Security Council and the opportunity to end the ongoing civil war in Syria. The Economic and Social Council coordinates the U.N.’s economic and social work. This means coordinating the actions of a host of agencies and programs, including the Food and Agriculture Organization, the World Health Organization, the U.N. Educational, Scientific and Cultural Organization (UNESCO), and programs such as the U.N. Development Program, the U.N. Children’s Fund and the Office of the U.N. High Commissioner for Refugees. The U.N. Charter established the Trustee Council to supervise the administration of Trust Territories, former colonies or dependent territories. Since its creation, the Trustee Council has assisted more than 70 former colonies in gaining independence. The last territory to do so was Palau in 1994. Since then the Trustee Council voluntarily suspended its activities, though it remains able to meet and act as needed. The International Court of Justice (ICJ) is the U.N.’s judicial branch and located in The Hague, Netherlands. The ICJ only deals with disputes between countries, not individuals — and countries must agree to be subject to ICJ’s jurisdiction. Presiding over ICJ cases are 15 judges, from different countries around the world, who serve nine-year terms. The U.S. withdrew from the court’s jurisdiction in 1986 following a ICJ decision that the U.S. violated international law by supporting rebel groups that opposed the Nicaraguan government. More recently the U.S. and the ICJ have disagreed over America’s obligations to advise Mexican nationals on death row about their rights to contact the Mexican consulate. 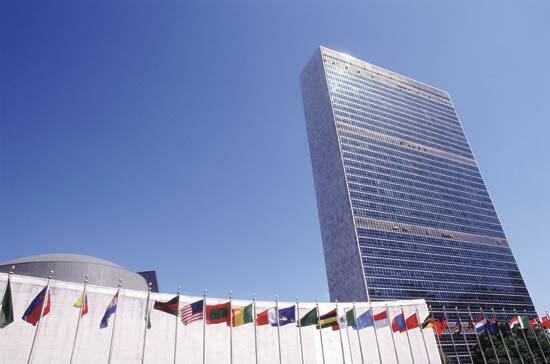 The last U.N. organ is the Secretariat, which comprises the international staff. With more than 16,000 global civil servants, the Secretariat administers the programs and policies of the other UN branches. Heading the Secretariat is the Secretary General (currently Ban Ki Moon from South Korea), who is appointed by the General Assembly for a five-year term. The General Assembly may discuss any matter arising under the U.N. Charter, excluding topics currently being considered by the Security Council. Decisions on admitting new member countries and the U.N. budget are decided by a 2/3 majority. Other issues are decided by a simple majority. In addition to member countries, two entities have a standing invitation to participate as observers in the work of the General Assembly and maintain a mission at the U.N. headquarters, the Holy See (an ecclesiastical jurisdiction of the Catholic Church) and Palestine. 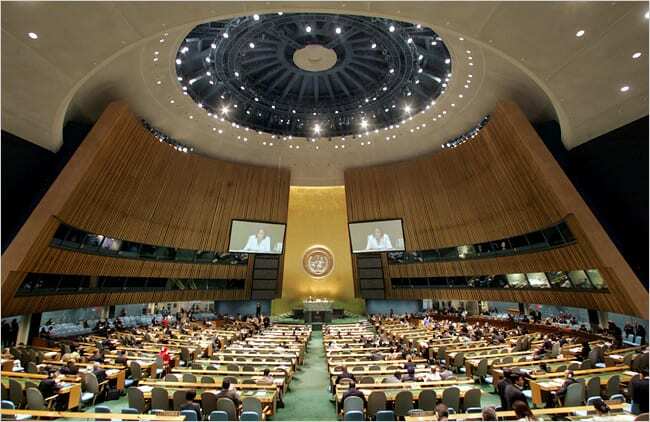 The General Assembly, where 193 members of the U.N. discuss international issues. Sixth Committee (Legal): Deals with international legal matters. How does this relate to my traveling to the U.N. headquarters to speak on armed conflict and the environment? Remember that the General Assembly does much of its work through the six committees mentioned above. The Sixth Committee is the legal committee dealing with international legal matters. In the second session of the U.N. General Assembly in 1947, the committee recommended, and the General Assembly approved, establishing an International Law Commission (ILC) to promote “the progressive development of international law and its codification.” In 2013 the ILC decided to consider the protection of the environment in relation to armed conflicts. — C.J. Next up: My thoughts on the seminar. This entry was posted in Jenks' U.N. Talk on Armed Conflict & the Environment. Bookmark the permalink.